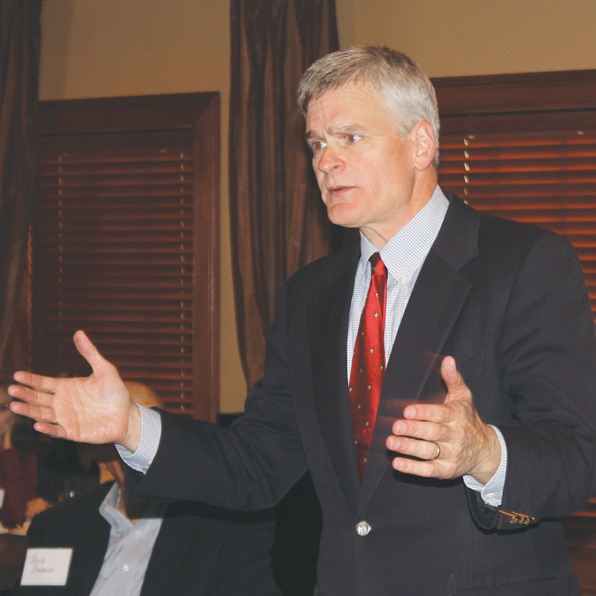 BATON ROUGE — Congressman Bill Cassidy (R-Baton Rouge) said Tuesday the election Nov. 6 will provide Americans with a stark choice — between the launch of a new American century and the danger of losing the country’s freedom. Cassidy spoke to the monthly membership meeting of the new Chamber of Commerce of East Baton Rouge Parish at Café Américain on Jefferson Highway.The local physician who was first elected in 2008 is seeking his third term in Congress next Tuesday. His seat is considered safe, and he has only Libertarian and Independent opponents.Cassidy said he was impressed by the great crowd in attendance and the energy and excitement he found in the new Chamber. The reelection of President Obama would lead to less freedom, higher taxes, and a corporate state form of government, he said. Dr. Cassidy came to the meeting straight from seeing a patient. • In 1970, Social Security, Medicare, and Medicaid represented only a small part of the federal budget but, at the current rate, it will be 100 percent of the federal budget within 18 years. Obviously, that cannot be allowed to happen. • The new health care law, or Obamacare, has set the stage for an explosion of debt. • Medicare will be bankrupt in the next 12 years, but Obama is ignoring the problem. Cassidy said health care decisions should be made by the average family — not by Washington bureaucrats. Cassidy said the future will be bright if America and Louisiana in particular are allowed to develop their energy resources. Cassidy has been endorsed in his reelection bid by the Republican Party of East Baton Rouge Parish. He is opposed by Rufus Craig, Jr., a Libertarian, and Richard Torregano, who has no party affiliation.